San Francisco 49ers quarterback Colin Kaepernick has been drawing a lot of heat after he refused to stand for the national anthem at an Aug. 26 game to protest racial inequality. Despite threats, boycotts and accusations of disrespect, he maintains that he will not stand for the anthem until the flag represents “what it is supposed to represent” and he can “help make America better” by calling attention to the problem. Kaepernick began sitting to call attention to police brutality and the social injustices he perceives are happening to people of color. 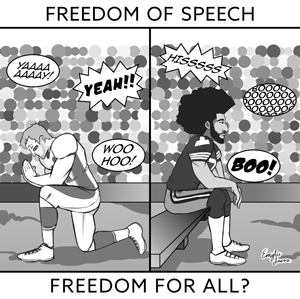 His most vocal critics do not seem to recognize that Kaepernick is protected by the very same rights that allows them to speak out against him. Kaepernick’s critics have every right to voice their criticisms. The freedom of expression promised by the First Amendment should rightfully protect them. It is no different for Kaepernick. Many are labeling Kaepernick as a traitor and an “un-American.” Furthermore, many have made the claim, including Republican presidential nominee Donald Trump, that if Kaepernick is unhappy with the way things are, he should leave the country. This claim is completely ludicrous and counterproductive. Should an American citizen not have the right to exercise his freedom of speech to seek reform in his country? Ignoring his rights by threatening him, demanding his job or telling him to leave the country goes directly against the U.S. Constitution and the very tenets of American patriotism. After first sitting down for the anthem, Kaepernick changed to kneeling before the flag to show respect while still separating himself to protest. On Sept. 11, the 15th anniversary of 9-11 and the first Sunday of the regular NFL season, Kansas City Chief player Marcus Peters and Patriots players Martellus Bennett and Devin McCourty held their fists in the air, reminiscent of black power protests in the 1960s. The entire Seattle Seahawks and Kansas City Chiefs teams locked arms as a way of honoring the flag and supporting Kaepernick. Rights should not be ignored for the convenience of an argument, especially when that argument is so deeply rooted in the First Amendment. Kaepernick is peacefully and gracefully protesting for a cause he believes in. Regardless of our individual stances, it’s our obligation to support all types of free speech, not just those that happen to coincide with our beliefs.